I also tried to make measuring of some device, but results are really bad (I compared it with another spectral analyzer - HP). Is there any option which I have to enable or change? Why is this happening? Also why are there distinct "peaks" on some frequencies? Thank you for help! 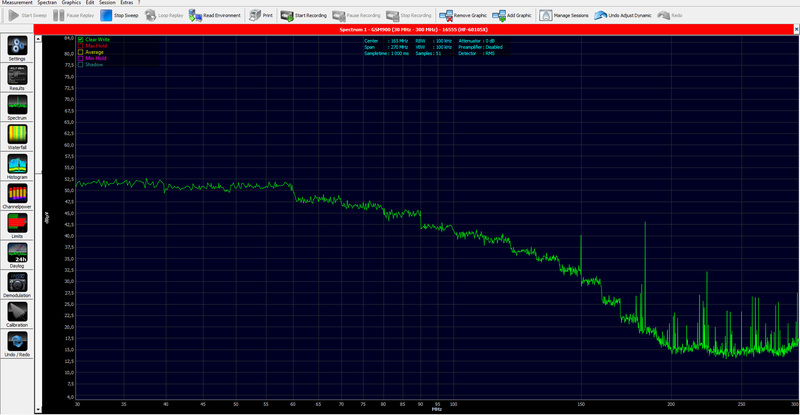 I attach screenshot of original app (MCS Spectrum Analyzer) and my application, results are simmilar. You simply get what you pay for: Without internal preamp and UBBV2-Option you cant expect anny better sensitivity in that frequency range. I didn't buy this device, I'm only programmer. So If I understand, there isn't any solution for getting better results, I can only buy another Spectran? Or is there any possibility to add option 020 and UBBV2 for my device? Yes you can upgrade your unit at any time. For option 020 (internal 15dB Preamp) you would get a upgrade code from us (no need to send the unit back for upgrade). The UBBV2 is an external preamp (40dB), so no need to send us the unit. This might be the best and also the most cost effectiv solution.